The book, featuring 42 original and Reagan-ized illustrations, is released on President Reagan's 107th birthday, February 6th. 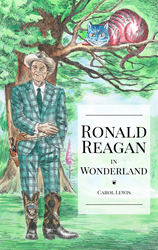 Ronald Reagan’s Adventures in Wonderland is a fan-fiction literary mashup tribute placing 40th US President Ronald Reagan in the place of Alice within Lewis Carroll’s beloved Alice in Wonderland; literature’s most-legendary whimsy starring the world’s most-legendary president. Reagan in Wonderland answers the question: What experience might the most emblematic figure of classic American values have in present-day America? Alice’s frustrations in the nonsensical world of Wonderland are a perfect metaphor for Reagan-era values seemingly at odds with our nation’s current political expressions, both conservative and liberal. As Alice never seemed to “fit” in Wonderland, nor would it seem President Reagan fit in the seismic chaos of modern-day cultural faultlines. Through Alice’s words, however, the late president and Great Communicator is a granted a voice once again. And in this modified rendering, featuring 42 original and Reagan-ized illustrations, The Gipper has a lot to say. Ronald Reagan fans and historians alike will revel at the Reagan trivia and references that trickle down throughout the book. The original British English of Carroll’s text has been converted to American English because America is the Undefeated World War Champion (also, for readability). Where Alice’s age is referenced, instead Mr. Reagan here is presented during his presidency. As such, even Vice President Bush makes an appearance! For the ultimate Ronald Reagan fan, collector of Alice in Wonderland ephemera, or anyone who enjoys a thoughtful read, Ronald Reagan in Wonderland is a fun mashup that is not only hysterical, but topical. To some, this can read as the tragic ballad of President Reagan’s battle with Alzheimer’s disease. To others, it’s an allegory for the changing landscape of American politics. To all, it’s a rally cry: As do Alice – and with this book – now Reagan, journey through and then awaken from Wonderland, so perhaps might we. Ronald Reagan in Wonderland is available on Amazon.com and wherever books are sold.